I grew up on fairy tales. As a young child, I loved my copy of Grimm’s Fairy Tales, where often, the characters weren’t who they appeared to be. Disney began to capture these stories in animation, creating child friendly versions of the sometimes dark tales. There was always a villain, a hero and someone to rescue or someone who didn’t realize who he or she truly was. The classic story of Sleeping Beauty was animated by Disney in 1959. I watched that movie, my kids watched it and my granddaughter, Aubrey, loved it for a time before moving on to another favorite. The summary of the film says, “A snubbed malevolent fairy casts a curse on a princess that only a prince can break, with the help of three good fairies.” When I saw the trailer for the new movie, Maleficent, I was immediately intrigued. Here was the rest of the story about that snubbed malevolent fairy. I love back story films that fill in the gaps of a familiar tale. For my first today, I got to see Maleficent, and learn her version of what happened. My sister Linda and my mom attended with me. 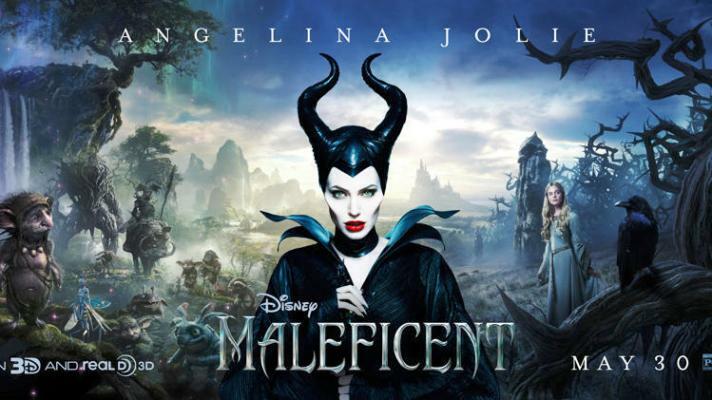 Maleficent stars Angelina Jolie, Elle Fanning, Sharlto Copley, Sam Riley, Imelda Staunton, Lesley Manville, and Juno Temple and was directed by Robert Stromberg. It is rated PG and has a run time of 1 hour and 37 minutes. This is a live action film, not an animation. The storyline, as written by Walt Disney Pictures, states: A beautiful, pure-hearted young woman, Maleficent has an idyllic life growing up in a peaceable forest kingdom, until one day when an invading army threatens the harmony of the land. 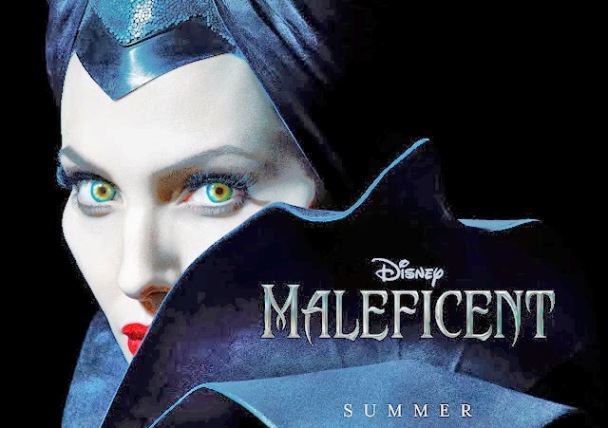 Maleficent rises to be the land’s fiercest protector, but she ultimately suffers a ruthless betrayal – an act that begins to turn her pure heart to stone. Bent on revenge, Maleficent faces a battle with the invading king’s successor and, as a result, places a curse upon his newborn infant Aurora. As the child grows, Maleficent realizes that Aurora holds the key to peace in the kingdom – and perhaps to Maleficent’s true happiness as well. Visually, this is a gorgeous film, rich in colors and whimsy. The peaceable forest kingdom is full of magical beings, beauty and enchantment, and Maleficent, played by Angelina Jolie, is equally magical, beautiful and enchanted. That is, until betrayal strips her of her magnificent wings and her belief in love and in the goodness of people. As she grows dark within, her outer world, the forest kingdom, grows dark as well. Her wrath, and desire for revenge, brings a curse upon Aurora that no power on earth, even Maleficent’s, can undo. Aurora, played by Elle Fanning, is the bright, shining soul in the movie. Joyful, compassionate, open to receive all that life can bring, she forms an unlikely friendship with Maleficent, believing her to be her fairy godmother. The bond between them deepens as Aurora reaches the age of 16, and faces a destiny that only true love can alter. I enjoyed the nods to the original Disney animation that were sprinkled throughout the movie. We learned why Maleficent is a wingless fairy. How she obtained her staff and her sidekick black crow. The costumes were similar enough to bring nods of approval and as the final credits rolled, there was even a familiar song. Most of all, I enjoyed seeing this character fleshed out and given a heart. She was both a hero and a villain, much as Elphaba is in the musical Wicked. There were moments I laughed, times I said, “Ahhh…” as realization dawned and scenes that brought tears to my eyes. This is a movie about the cruel, binding power of revenge and the even greater, freeing power of forgiveness. And it is a movie about the transformative ability of true love. Disney is creating a new reality, with its recent movies Brave, Frozen and now Maleficent, about what true love looks like. And I’ll give you a hint…it does not exist between two people who have only just met. Once again, not all is as it appears to be in Disney’s Magic Kingdom, and outward appearances and titles can be so deceiving. It’s the heart that matters. And the beauty within that creates the beauty without. It was good to be reminded of that again this evening. Let me know what you thought of the movie, when you see it!